Simply the best low cost embroidery only machine you can get in U.S. It packs a lot of features for minimal price. Highly rated by users. 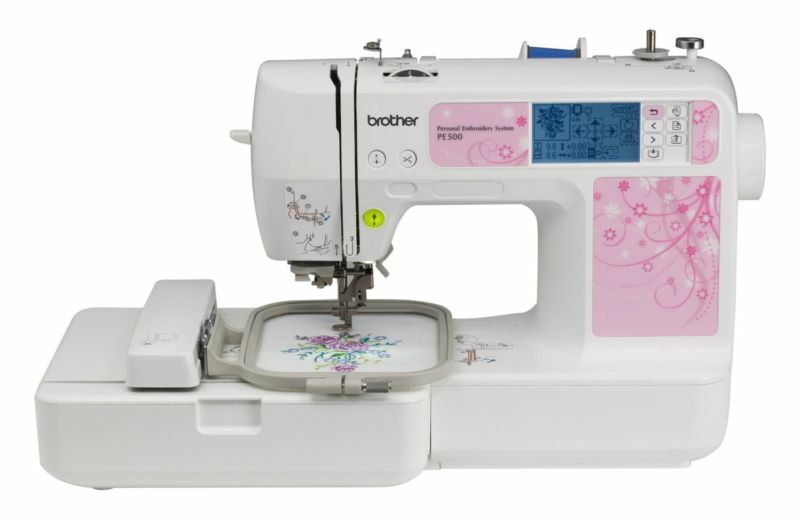 Brother PE500 is an embroidery only machine, it doesn’t have sewing capability. It comes with quite a lot of features that you normally find only on expensive embroidery machines. It has a spacious 4″ x 4″ embroidery area. It comes with 70 built-in embroidery designs, 120 frame patterns and 5 built-in font styles. The backlit LCD touch screen display lets you edit settings, select designs and view tutorials. Brother PE500 comes with a very good work light. It has a convenient bobbin winding system which makes it very easy to wind the bobbins. The bobbin system is drop-in, which adds to the ease of use. The best thing about this embroidery machine is the computer connectivity. You can import designs and keep the machine up to date by downloading machine updates. You can download designs from ibroidery website, most of them are free. Brother PE500 has an embroidery area of 4″ x 4″ which is enough for beginners but it is small when compared to professional embroidery machines. But you can’t ask more for the price either. Brother PE500 memory can only store up to 12 downloaded designs, which means you will have to delete some to load new ones.